Castiglione agritourism farm is located in Sansepolcro in the Province of Arezzo on a farm extending more than 100 hectares, originally a farmhouse at the end of the1800's. This farmhouse was home to many families of farmers who lived only from cultivation of the land and raising livestock. Castiglione agritourism farm is the site of many memories over a long history of war, rebirth and prosperity. The passion for this land and for Tuscan tradition led us to renovate the ancient farmhouse, attempting to preserve all its original characteristics. 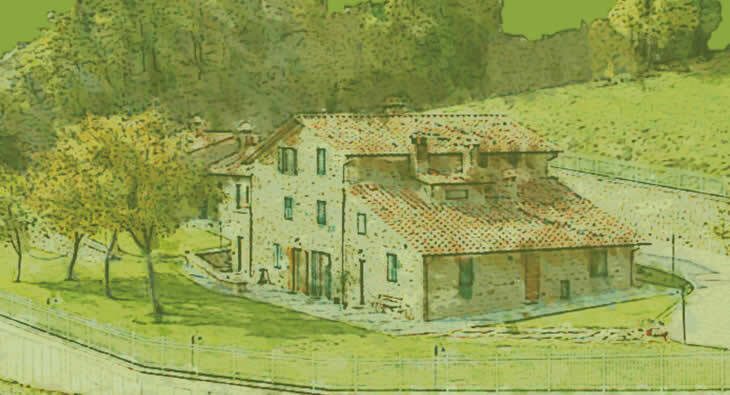 The imposing stone structure of the original Tuscan farmhouse remains with its ancient wooden beams, inspiring the names of our apartments: Cantina, Fontanile, Vaccaio, Volpaia and Fattore. Our vacation apartments are large and welcoming, equipped with every convenience, such as the lovely Renaria stone hearth, typical of Tuscan homes, the bedrooms with color TV and private bath. The Agritourism farm offers its guests a beautiful pool set in the green park surrounding the apartments.